Dan Rather’s lecture is the culminating event of our Ninth Annual Business Conference. 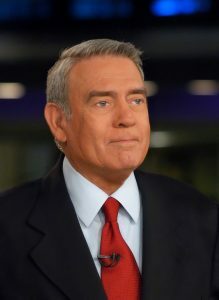 For more than 50 years, former CBS News anchor and 60 Minutes correspondent Dan Rather has been the embodiment of the intrepid broadcast journalist. From the Kennedy assassination—where he was the first to break the news that the president had been killed—to the Indian Ocean tsunami, he has covered every major story of our time, with distinction and a fierce dedication to hard news. For his unparalleled devotion to his craft, he was named the 2012 recipient of the Edward R. Murrow Award for Lifetime Achievement. Rather’s reporting skills are legendary, and his single-minded pursuit of the story has taken him to datelines as far ranging as Vietnam, Afghanistan, Iraq, China, Russia, and Cuba. He has served as a correspondent during the Vietnam War, the mujahadeen uprising against the Soviets in Afghanistan, and the first and second Iraq wars. He was among the first western journalists to report on the 1989 Tiananmen Square protests and the last reporter on the air when the Chinese Army moved in with force. He has interviewed Mikhail Gorbachev in Red Square, and Fidel Castro in Havana. On the domestic front, Rather has covered every presidential campaign since 1952. He was White House correspondent for CBS News during the administrations of Presidents Johnson and Nixon, and was a leading force in broadcast news investigation of the Watergate scandal. During the 1960s, as chief of CBS’ Southwest Bureau, Rather reported from the flashpoints of the Civil Rights struggle in the South. Rather has brought his experience to bear on the biggest stories of recent years. On September 11, 2001, Rather stayed on the air for 18 hours straight to bring Americans news of the deadly attacks on the World Trade Center and Pentagon. In the days and weeks that followed, he became the first journalist to report from underneath “The Pile” at Ground Zero and his appearance on David Letterman’s first post-9/11 broadcast has been credited as a touchstone for American sentiment during those difficult days. During the American-led fight against the Taliban, Rather returned to Afghanistan several times. The first American network anchor to report from Iraq after the fall of Baghdad, Rather in 2004 broke the shocking story of the Abu Ghraib prison abuses—for which he was recognized in 2005 with prestigious Peabody and Sigma Delta Chi Awards. In 2011, he received the CPJ Burton Benjamin Memorial Award for his work as an original supporter in defending independent reporting. These plaudits are but the latest in a career’s work that has earned him several Emmys and just about every honor there is in broadcast journalism. Despite a lifetime of accolades Rather never lost his drive for front-line journalism. After leaving CBS News, he pioneered a cable news magazine program doing exactly the kind of in-depth international and investigative reporting that has become such an endangered species on television. From the melting arctic to the battlefields of the Middle East, from inner city classrooms to big money politics in Washington, Rather and his team produced over 300 hours of award-winning news and documentary programming. He has covered important social issues such as substance use disorders, mental health, and homelessness and poverty, always bringing us the real story with grace, humanity, and depth. Constantly looking to innovate new avenues for quality journalism, Rather has now launched a production company called “New & Guts.” He is developing a series of projects ranging from an acclaimed interview program on AXS TV to documentaries and digital video content. His continued restlessness in pursuit of excellence would be evident to anyone who read his entertaining memoir Rather Outspoken: My Life in the News, published in 2012. Most recently, Rather was played by Robert Redford on the big screen, in James Vanderbilt’s critically acclaimed drama Truth, recounting the story that became known as Rathergate, in which a “60 Minutes” team, led by producer Mary Mapes and spearheaded by Rather’s meticulous reporting skills, discovered in the middle of the Presidential election that incumbent leader George W. Bush might not have fulfilled his National Guard service during the Vietnam War. The film premiered at the Toronto Film Festival and went on to a successful theatrical release in October 2015. A native son of Texas, Dan Rather is well-known for his humor, colorful speaking style and the home-spun “Ratherisms” that he has used with greatest exuberance in his election coverage. During the wee hours of the 2000 Election Night marathon, Rather commented that “We don’t know whether to wind our watch or howl at the moon,” after noting earlier that “[Vice President Al] Gore’s got his back to the wall with his shirttails on fire in Florida.” Rather is also a prolific author, having written, co-written, or contributed to several books. As a speaker, few can match the authority, experience, and perspective Dan Rather offers on world events and the passion he displays in defense of journalism.